The drink menu of Bar Tycoon allows you to set the drinks that you may serve to your customers during a shift. The drink menu can be changed at anytime when not on a shift. It is a good idea to either mix up your drink menu of varying ingredients/tastes or to focus on hitting hard on certain ingredient groups like beer or wine. The choice is up to you. You can access the drink menu in the Home menu. The recipes you know (or don't know) are cached by the game every hour to make the pages that have hundreds of recipes load very quickly. You can tell the game you'd like it to “relearn” what you can create by clicking on the appropriate link in the book mark section. The drink menu uses a checkmark list of different recipes. 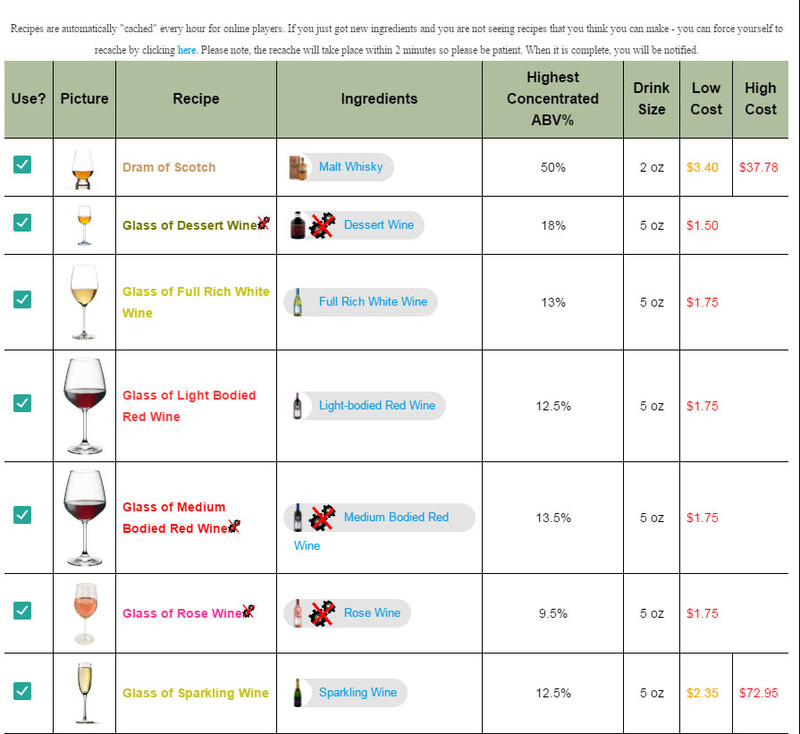 A great way to clear up your menu is simply click “Use Checkmarked Drink Recipes for Drink Menu” after a shift. This will automatically clear up drinks you can no longer make and lets you know how many more drinks you can fit on your menu. Drink menus have no minimum BUT you cannot exceed 20 drinks on your menu. Per 5 levels you gain, you also are allowed an extra drink recipe.